A view of Curiosity’s dusty exterior. 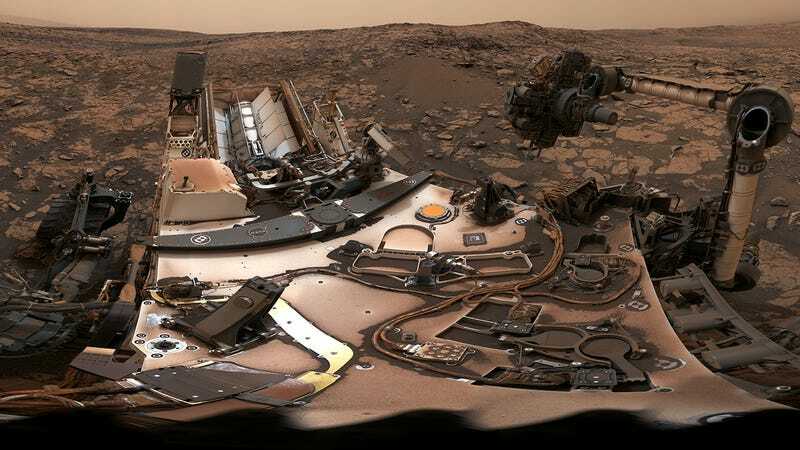 A new 360-degree panorama captured by the Curiosity Rover is one of its best yet. The photos used to create this mosaic were taken by Curiosity on August 9, 2018, at Vera Rubin Ridge, where the intrepid rover has been working over the past several months. The image shows the Red Planet’s iconic butterscotch-colored sky, though it’s a bit darker than usual owing to a dissipating global dust storm. Curiosity’s counterpart, the Opportunity rover, is currently on the other side of the planet where the storm was much worse. NASA had to put Opportunity into hibernation mode as the dust storm made it too dark for the rover’s solar panels to collect energy. It’s not known when—or even if—Opportunity will return to active duty. The full 36-degree panoramic view. Anyhoo, Curiosity doesn’t seem to have been affected by the storm, but as the new panorama shows, a fair amount of dust has collected atop its surface. The rover landed on Mars on August 6, 2012, and it’s been steadily collecting dust ever since, with no one around to sweep it off. NASA says Curiosity has never surveyed an area with so much variation in color and texture. Indeed, hard rocks are a subject of concern at the moment. Curiosity’s most recent drill attempt went well, but the prior two attempts at extracting rock samples weren’t so fruitful, as the rover’s drill was unable to penetrate through some unusually hard rocks. The six-wheeled rover has been using a new drill method over the past few months as a workaround to a mechanical problem. To date, the new technique has worked well, matching the effectiveness of the previous method. NASA says the old technique wouldn’t have worked on the hard rocks either, and that it wasn’t a limitation of the new method. Much of the ridge contains hematite, a mineral that forms in water. There’s such a strong hematite signal that it drew the attention of NASA orbiters like a beacon. Could some variation in hematite result in harder rocks? Is there something special in the ridge’s red rocks that makes them so unyielding? Looking at Curiosity’s upcoming schedule, the rover will extract a couple more rock samples later this month. In early October, the rover will ascend higher up Mount Sharp as it heads to areas rich in clay and sulfite materials. It’ll undoubtedly gather some important scientific data, but we’re also looking forward to the rover’s view from this higher elevation. For those of you looking to make this image your desktop wallpaper, go here.